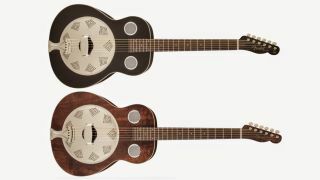 Fender has expanded its resonator range with a pair of new round-neck acoustic models, the Brown Derby and Top Hat. Both models share laminated mahogany and maple body and top construction and "special Eastern European 'Continental' cones of hand-spun aluminum" (aluminium for UK readers). Other common features include C-shaped necks, maple biscuit bridges, 16-inch fingerboard radiuses and 20-fret rosewood fingerboards, bone nuts and Telecaster-style headstocks. The Top Hat comes in a black satin urethane finish and the Brown Derby is, somewhat appropriately, finished in brown satin urethane. With US street prices around $349, both models provide an affordable way to add rootsy resonator sounds to your arsenal. Visit Fender for more.